When you're staying with us and flying from Stavanger Airport, you can relax at the hotel almost until it's time for you to check-in. Because the hotel is only a few minutes' walk from the airport. If you have time, we recommend a walk along the beach which is right by us. There are white sandy beaches here as far as the eye can see. Find out more about Sola and Stavanger here. With 14 modern conference rooms, we can arrange meetings, conferences, events and conventions for 2 – 1,250 people. More information about conferences here . Kitchen & Table by Marcus Samuelsson is a restaurant concept at Clarion Hotels, and now we're opening Clarion Hotel Air as well! Here we offer what we call Fun Dining rather than fine dining, in an inviting, warm and relaxed atmosphere. Drop by any time and experience dishes inspired by a blend of Manhattan and Stavanger. More information about dining experiences here. 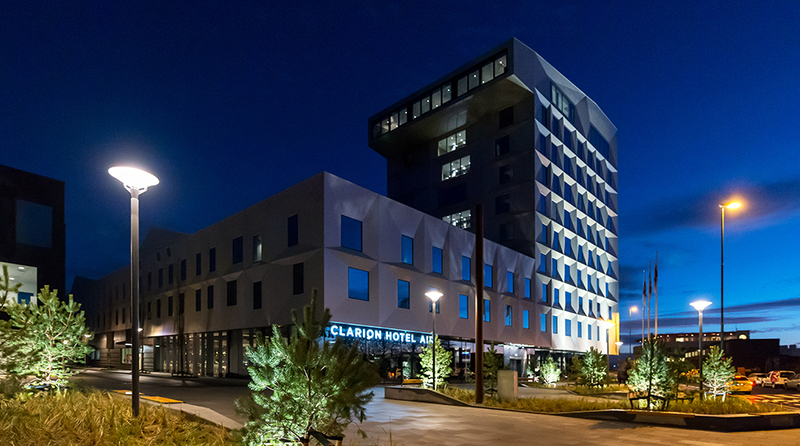 Clarion Hotel Air is cash-free, which ensures added security for our guests and visitors. More information about this can be found under FAQs. Bus to Stavanger Airport Sola. Our shuttlebus runs from the hotel to Stavanger Airport Sola and is FREE OF CHARGE for guests. Please contact the reception for information about departure times. is right by the hotel.